This vivid space wallpaper is a color-coded topographical map of the southeastern flank of the Olympus Mons volcano on Mars. This vivid space wallpaper is a color-coded topographical map of the southeastern flank of the Olympus Mons volcano on Mars. 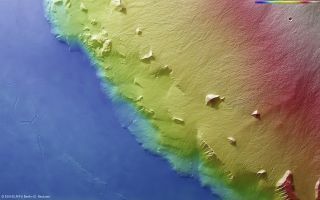 The transitions from the sloping flanks of the volcano (white, red and yellow colors) to the steep cliff faces (green to light blue) and the smooth plains at its base (dark blue) can clearly be seen. The image was taken by the High Resolution Stereo Camera on ESA’s Mars Express on Jan. 21, 2013 and released April 2, 2013.